A story that begins in 1783 in Bergamo, Northern Italy. The same year Mozart’s opera ‘The Marriage of Figaro’ opens at the Burgtheatre in Vienna, the American war of Independence ends and the Montgolfier brothers fly their hot air balloon over Paris. Franchi are the oldest family-run seed company in the world and are much more than just seeds in a packet - they are a story of tradition, experience, quality, passion and excellence handed down over seven generations that continues today alongside state of the art technological solutions. The vast majority of Franchi’s vegetable seeds are still commissioned, not bought in and many continue to be produced in their home regions. Some of our growers have been producing seeds for Franchi for generations. Each farmer is given Franchi stock seeds, is regularly visited and must meet the strictist standards. We produce hundreds of tonnes of seed in this way - just for our customers, and Franchi have sole responsibility for maintaining 70 important national original( heirloom) varieties which would have otherwise been lost. All Franchi seed is tested for germination and purity and is unconditionally guaranteed to meet or exceed the stated specifications.Franchi Sementi vegetables are predominantly open pollinating original varieties that are grown above all for the eating quality and are GE free. No seed is chemically treated. 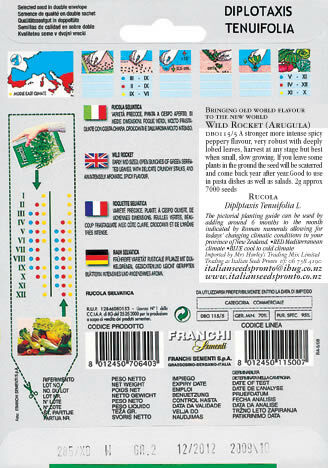 While vegetable descriptions and growing information on the back of most Franchi packets ( see left) is in Italian, a brief description and cultural information in English is also provided. The pictorial planting guide can be used by adding around 6 months to the month indicated by Roman numerals allowing for todays’ changing climatic conditions in your province of New Zealand.Follow the blue sowing guide.